College basketball season is creeping up fast, and Athlon Sports is counting down to Midnight Madness and the start of practice on Oct. 17. No. 3 Arizona enters the 2014-15 season as the established power in the Pac-12. It’s been a long road back, but Sean Miller has restored the Wildcats to prominence in the West for years to come. After reaching the Elite Eight twice in the last four seasons, Arizona is seeking to take the next step by reaching its first Final Four since 2001. 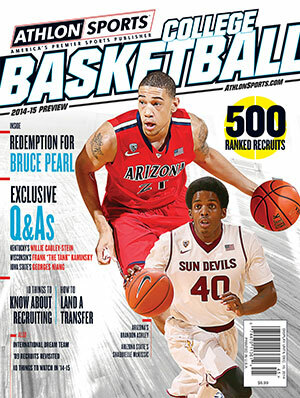 The Arizona edition is one of dozens available in our online store and on newsstands everywhere now. No league team has gone undefeated since the Pac-10 was created 36 years ago, and Arizona coach Sean Miller won’t touch the subject. Miller’s sixth Arizona team projects to be his most talented in Tucson and could perhaps challenge the five Lute Olson-coached teams that went 17–1 in the conference. Coming off a 33–5 season, in which the Wildcats were ranked No. 1 for eight weeks, Arizona appears deeper, a better shooting team with fewer weaknesses. In addition, it will approach the season with a chip on its shoulder. “We left some money on the table last year,” says sophomore forward Rondae Hollis-Jefferson, who is likely to be an all-conference player. “We didn’t finish the job." Pac-12 Player of the Year Nick Johnson and Pac-12 Freshman of the Year Aaron Gordon combined to play 64 minutes per game before leaving early for the NBA Draft. Competition for those minutes will be brutal. Junior forward Brandon Ashley, who broke his foot after starting the year’s first 21 games — in which Arizona went 21–0 — will take Gordon’s spot. Johnson’s shooting guard role will be contested by, among others, National Junior College Player of the Year Kadeem Allen. Allen is part of a five-man recruiting class that some ranked as high as No. 2 in the country. It includes 6-6 Stanley Johnson, who, like Gordon a year earlier, was California’s prep Player of the Year. The newcomers have a high defensive standard to live up to. “We were successful last year because our defense held up,” says Miller. Held up? The Wildcats limited opponents to 58.6 points per game, lowest at Arizona in the Pac-10/Pac-12 era. Miller has created an identity as an elite recruiter who plays a deliberate style, overpowering opponents with defense and rebounding. This year he has the pieces to take Arizona to its first Final Four since 2001. Kaleb Tarczewski has started 70 games over the past two seasons. The 7-footer is an improved shooter (58.4 percent) and powerful defensive presence. One critique: He only had two double-doubles last season. Ashley, a score-first power forward with shooting range to 15 feet, is all-conference caliber. Miller might choose to use energetic Hollis-Jefferson in a sixth-man role, in which he thrived as a freshman. Hollis-Jefferson averaged 25 minutes as a freshman and was one of the club’s top players in the postseason. Ashley and Hollis-Jefferson can both play multiple positions, which will determine if Johnson plays shooting guard or small forward. Senior point guard T.J. McConnell was a steadying influence as a junior, averaging 32 minutes and a 3-to-1 assist-to-turnover ratio. He has a defense-first, team-first mentality and is tenacious. Returning starter Gabe York will have to fight for a starting job at shooting guard with Allen and Johnson, who can swing between small forward and shooting guard. The only potential backup at point guard is freshman Parker Jackson-Cartwright, a highly regarded recruit from Los Angeles. Arizona is seven players deep and possibly eight if sophomore Elliott Pitts, a shooting guard, plays as well as he did late last season. On paper, the Wildcats are superior to Miller’s Elite Eight clubs of 2011 and 2014, both of which won Pac-12 championships. The most intriguing variable is how Johnson and Hollis-Jefferson will mix. Is Johnson a 2 or a 3? Is Hollis-Jefferson a 4 or a 3? It might not matter. With two potential NBA players, Ashley and Tarczewski inside, opposing defenses won’t likely be able to do much more than pick a poison. This could be the year he sheds that reputation. Stanley Johnson, a 6-6 swingman, ranks among the most coveted recruits in school history. He is apt to lead the club in scoring as a freshman. Junior college transfer Kadeem Allen, is expected to give returning starter Gabe York a fight for the starting job at shooting guard. Dusan Ristic, a 7-0 Serbian freshman, is a low-post scorer with semi-pro experience overseas who could force his way into the rotation early. Point guard Parker Jackson-Cartwright will backup T.J. McConnell.